Sometimes you want to cook a meal where there are no leftovers. You want it all fresh and you want just enough for those in your household. Well, if you’re like me, that means only enough for two and this recipe is perfect. I’ve never cooked scallops before and honestly, it wasn’t very hard at all. Just like most seafood, they cook rather quickly and taste delicious. 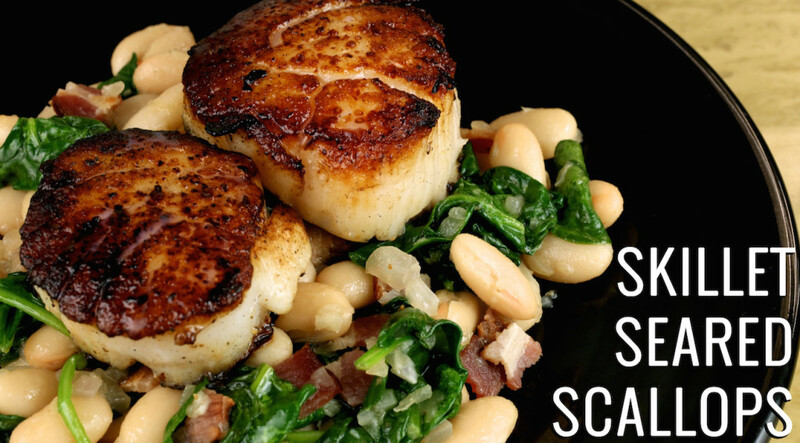 Searing gives them a caramelized outer shell that helps them just melt in your mouth. Add to that beans, bacon, and spinach?! Yeah, I can guarantee you this dinner will be made many, many more times. Pop open a bottle of wine, maybe light a candle or two and have yourself a romantic dinner. This recipe will make you feel classy, I promise. Place bacon in a pan over low heat and cook until it has begun to crisp. Remove from pan, let cool, and cut into small pieces. While bacon is cooling, add onion and garlic into the pan. Saute for 2-3 min. or until onion is soft and translucent. Add the spinach and when spinach is close to wilted, add the beans and the bacon back into the mixture. Cook for another couple minutes, until beans are hot. Keep warm. Dry the scallops completely with a paper towel and season with salt and pepper on both sides. Add the butter and the scallops to the skillet and sear for 2-3 min. on each side, until caramelized. Squeeze lemon juice onto the spinach and beans mixture and season with salt and pepper. 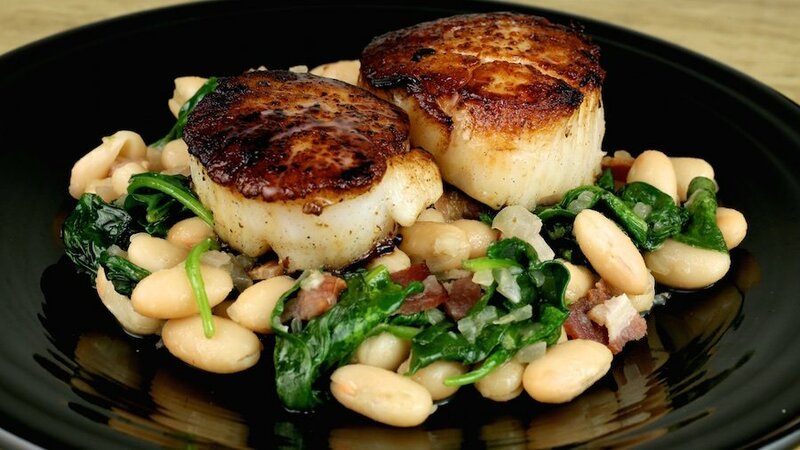 Divide the beans between two plates and top each with 2 scallops.